Hey guys! Yep, another new feature. 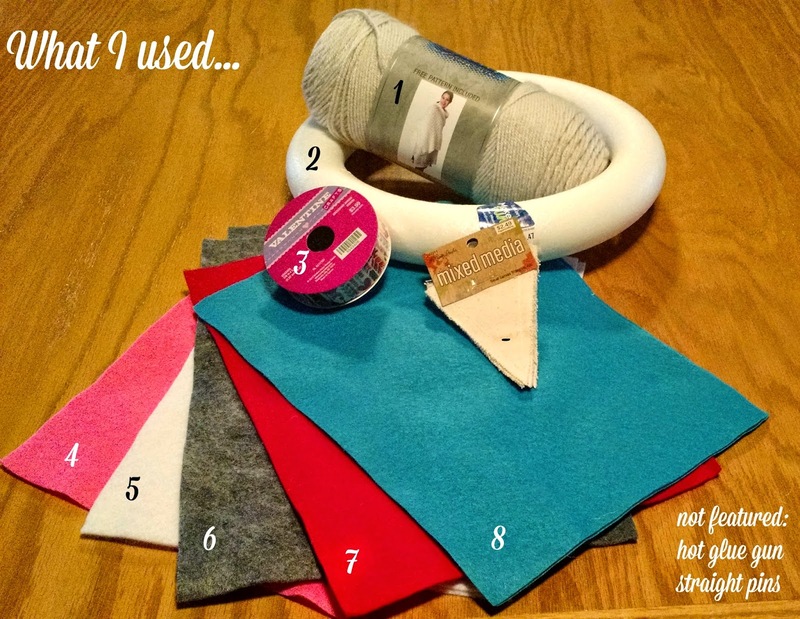 I figure the most sensible direction for me to head with this blog is to follow my passion in crafting. I'll have some other posts explaining more on that later next week, but for now let's get to the good stuff, yeah? From the poll I threw up a few days ago, the responses were pretty much all over the board between wanting to learn more about cards, paper crafting, gifts, and other general crafty things. Which is AWESOME because I like all of those things! So a variety will be happening. I like how well rounded y'all are. Stick around, please! For real though, now it's time to check out what I made for the inaugural Lisa is Busy Crafting! I was very inspired by Pinterest (duh) and the original wreath can be found here at Love of Family & Home. I absolutely ADORE red and teal together, so I left it a bit more every day feeling than straight up VALENTINE'S DAY, you know? Not featured: my trusty hot glue gun and the straight pins to stick the flowers in that I bought when I made my Thankful Wreath at Thanksgiving. 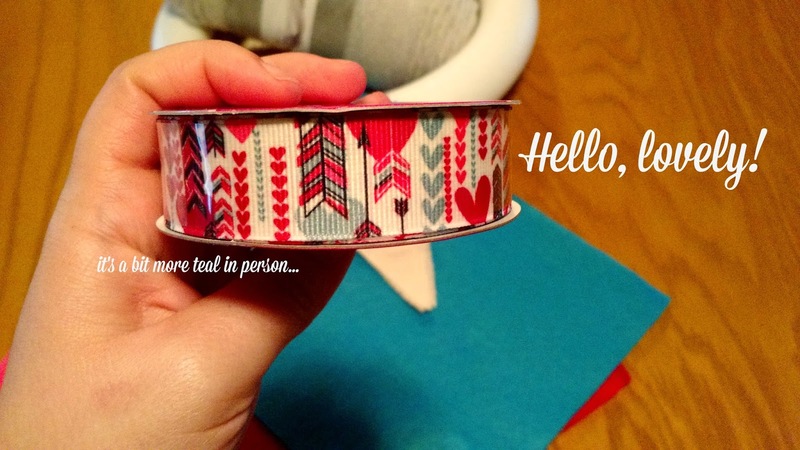 I used the Love of Family & Home site for my color palate inspiration initially, but when I got to Hobby Lobby I picked my ribbon first so I could make sure everything coordinated well. Thankfully the powers that be are also really into teal and red so finding a ribbon that I was hoping for was super easy! This was crazy simple to make! Seriously, for all of my passion for crafting, I don't have a ton of natural skills, so I have to aim pretty low when it comes to complication. For example, I don't have a bow on the top of mine like Love of Family & Home does because despite watching at least a half dozen YouTube videos on how to make a bow with a one sided ribbon, I could NOT make it happen. So rather than set my computer on fire out of rage, I decided to keep it simple and move on. I think it was for the best. 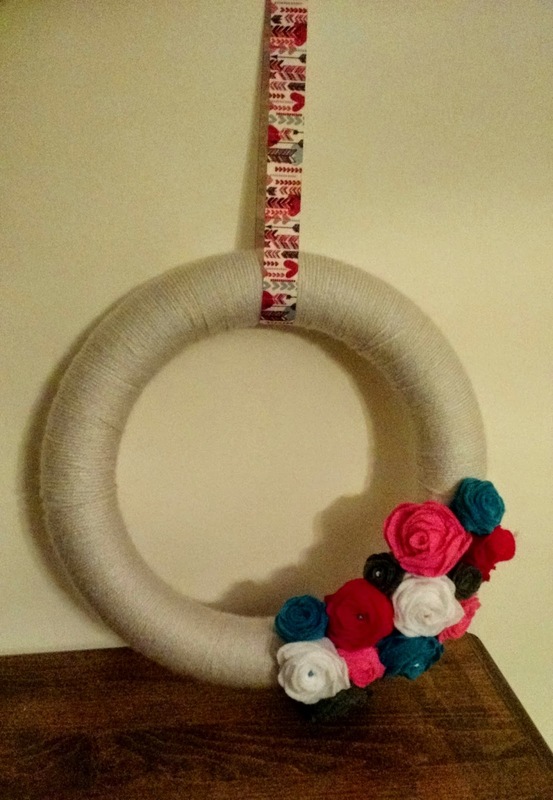 Anyway, you start off by wrapping your yarn around the wreath form. 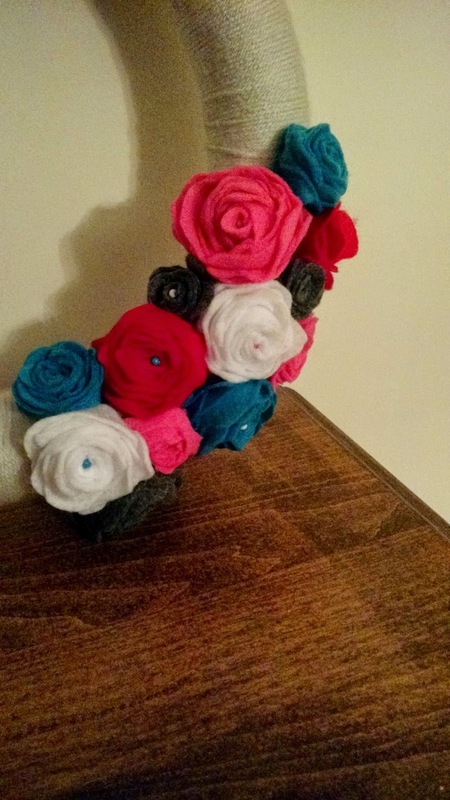 I used a straight pin to keep the yarn on the wreath as I wrapped and covered it up with flowers when I was finished. I chose a super light gray yarn so that if I didn't get the wrapping just right, it wouldn't show. This part took the longest, and I found it easiest to make a separate ball of yarn to thread easily through the wreath. I also used my knees as a prop so I got a thigh workout in today as well (heh). Next, making the little felt flowers. I was intimidated and I definitely didn't need to be! Believe me, if I can do it while taking breaks to make dinner, bathe and bed my kiddo and listen to Workaholics in the background, you can TOTALLY do this. I TOLD YOU IT WAS EASY! 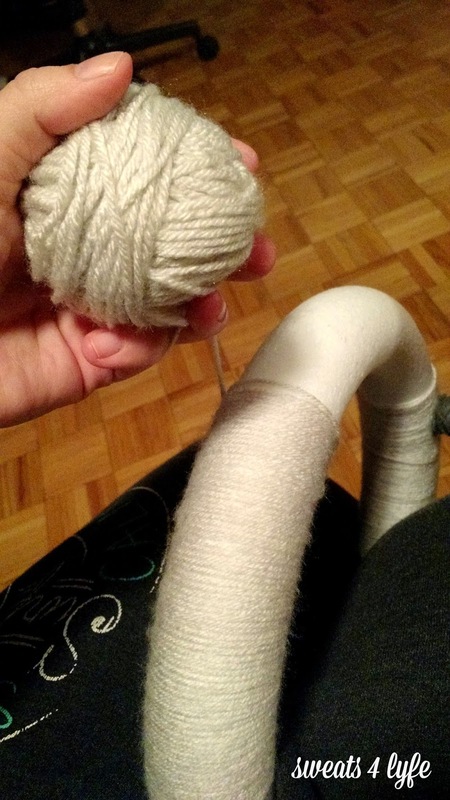 You cut a wobbly circle, make a wobbly spiral out of that, then start wrapping up the felt from the outer edge and BOOM. 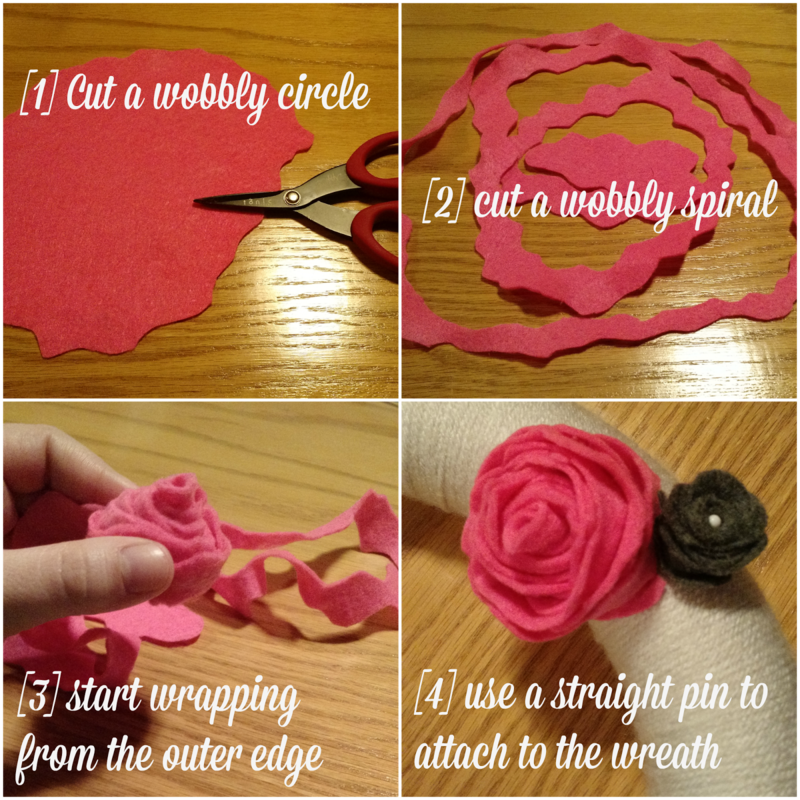 You have a little felt flower you pin to the wreath! Easy as that! I bet you thought I used my hot glue gun for this, didn't you? Nope! Just straight pins. Repeat with as many colors and flowers as your gorgeous heart desires! And the only thing I needed my hot glue gun for was sticking the ribbon to itself. I mean I could have used tacky glue and been fine probably but I never pass up an opportunity to bust out hot glue. At this point, I was starting to make the banner to put across the wreath and started to get cold feet. When the wreath is against the plain wall there, I feel like it needs it...but when it's against the door, it looks fine without it. Again, leaving the banner off made it more versatile so that was a bonus too! But you do what floats your boat. And there you have it! My very first Lisa is Busy Crafting! I'd call this one a success. Do you have any DIY Valentine's Decor up and around your house? Would you like to see what else I'm making for Valentine's Day around the house and as gifts? Do you love teal and red as much as I do? Seriously. And thanks for sharing that link! My goodness I'll take any help I can get at this point. Sweet project! I love the simplicity of it in color and design. 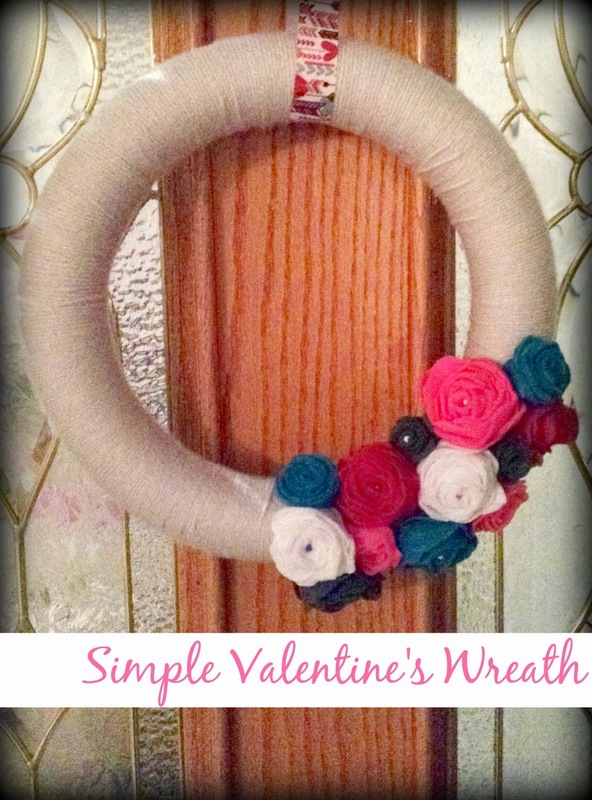 This is such an adorable wreath! 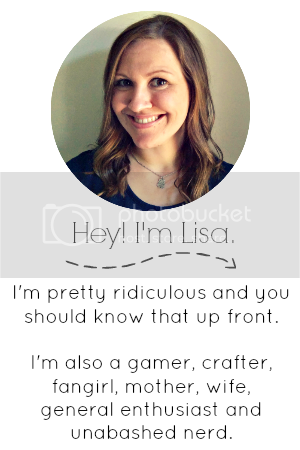 Thanks for sharing how you made it. LOVE seeing your crafting skills, lady!